It is sometimes necessary to attach the instrument leadwire to a strain gage before bonding the gage in place. Consider, for instance, the problem of installing a strain gage inside a small hole, or in some other challenging location where the solder tabs cannot be reached with a soldering pencil, or perhaps cannot even be seen. The need for pre-attached instrument leads may also occur when installing strain gage sensors on plastics. These materials are usually very low in thermal conductivity, and can be readily damaged (along with the gage) by excessive heat during soldering. Because of these and other situations in which it is either preferable or mandatory to solder leadwires to gages prior to bonding, the capability for doing so should be among the skills of any versatile gage installer. The major difficulty in pre-attaching leadwires to a strain gage is in accomplishing this and the subsequent gage installation without destroying the gage or degrading its performance. 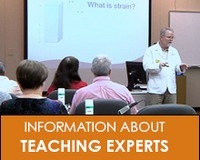 Beyond the usual elements of good strain gage practice, attention to a few special considerations will help assure successful installations by avoiding thermal and mechanical damage to the strain gage sensor. 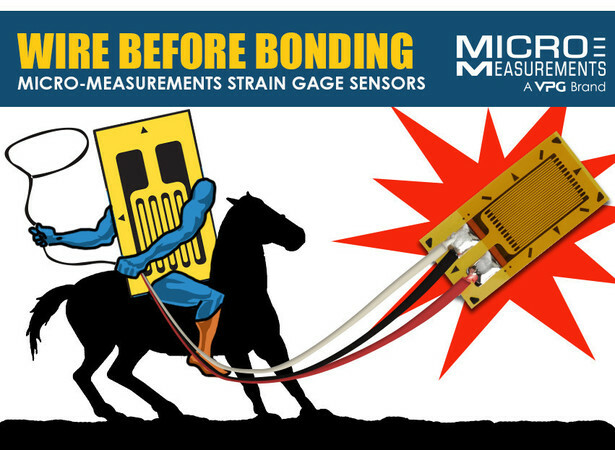 Strain Gage Type - Gages with flexible backing, such as polyimide, are most resistant to handling damage. Pre-attached terminals (Option W) or copper-coated solder tabs (CEA -Series strain gages) make the soldering easier and less likely to overheat the strain gage. 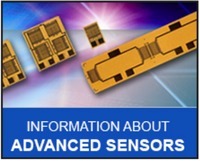 Adhesive – A strain gage with leadwires attached can be cumbersome. Epoxy adhesives are therefore preferable because they permit adjustable placement and clamping of the gage prior to curing initiation. Solder – The lowest melting point solder consistent with the adhesive curing temperature (if elevated) and the test temperature is obviously advantageous in minimizing the heat applied to the strain gage. Leadwire – Small-diameter leadwires require less heat for soldering, and cause fewer problems in obtaining uniform clamping pressure during adhesive curing. The effects of fine wires on circuit sensitivity and stability must be considered, however. Heat Sink – Firmly taping the strain gage to a chemically clean aluminum plate for the soldering operation helps in heat removal. Soldering Iron – A temperature-regulated soldering pencil – best for any strain gage wiring task – is necessary for controlled application of heat to an unbonded gage. Soldering Operation – Good soldering practice is essential. The smallest sufficient deposit of solder will minimize gage handling and clamping problems. Gage Cleanliness – Soldering to an unbonded gage generally contaminates the bonding surface of the gage with soldering flux residue. The gage must be recleaned with rosin solvent to restore proper bondability. Gage Handling – Once the leadwires are soldered to the strain gage, they offer the most effective means for handling the gage during placement and bonding to avoid excessive loads on the solder joints. The Tech Tip also includes specific recommendations for strain gage types, leadwires, solders, and other materials.